Pamper your man with the most masculine grooming set ever devised. 1 Aloe Based Shaving Cream 6 oz. 1 Menthol Based Face Wash 4 oz. 1 Tea Tree Based "2 in 1" Shampoo and Conditioner 10 oz. "Productivity" scented Soap Brick: This no-excuses block of wake-me-up soap slaps your senses with a cool splash of menthol and a clean mint scent. The steel cut grains scrub skin clean. "Achievement" scented Soap Brick: This block of soap crushes competitors with the unbeatable scent of bergamot and black pepper. It's like showering in bubbling, liquid gold—and if that's not a sure sign you've found success, then what is? 2-in-1 Hair Wash: This bottle knows how to multitask. It contains protein to pump your hair's strength up to 11, and vitamin B5 conditioners to keep it suave, all while waking your senses with a blend of tea tree oil and menthol. That's three things in your 2-in-1 bottle—and the kind of synergy that'll get your hair on a motivational poster. Face Wash: Whether it's enduring blistering winds on your arctic fishing vessel, or getting slapped by your beautiful spy nemesis, the average day can deal out a lot of punishment to your face. Wash it off with an energizing blend of menthol, jojoba oil, and vitamin C, with a dash of grit thrown in to build character (and for exfoliation). Shaving Cream: Is there anything manlier than starting your day by slinging an open blade around your face? This premium grade cream makes sure you do it right, with macadamia nut oil for the closest shave, Shea butter for hydration, aloe vera for cooling, and calendula extract for recovery. Lip Balm: Like a power tool for your lips, this pair of lip protectants helps shield against UV radiation, keeps working under extreme temperatures, and has been field tested by active military personnel. I bought this for my brother who's always busy and on the go! This gift was put to good use! Great for the busy, hard-to-buy-for guy! 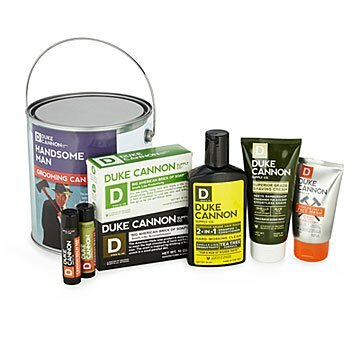 This is a Christmas gift so I won't know how he'll react quite yet but I can say that he really likes the Duke Cannon soaps! This set is perfect for the guy who is hard to shop for, (especially when he buys everything he needs) but also isn't a huge fan of heavily scented body wash etc. Can't wait for him to try it! I bought this set for my brother because he's a chef always on the go. He's the type of guy that has to shower at least twice a day so it's nice to know that this gift is put to great use. He loves all of it! It's so hard to find great gifts for my dad... I can't wait to give this to him!